Luckily 1888 was one of the years for which the cemetery’s burial records contained the buried person’s cause of death as it was listed on the death certificate. “Mrs. Virgia T. Hughes Age 29; I hereby certify that I saw her on the 12th day of Nov. 1888 that she died on the 17th day of Nov. 1888 and that the cause of death was Neurasthenia Complication Excessive Mental Emotion. J.T. Humphries M.D. WH Covy & Co.” Having read through Green Hill’s available records from 1884 to 1895, this was the only case of neurasthenia that I recall seeing. I believe that the spelling of her name on the marker is incorrect based on what I’ve seen in census records. If you were like me and had never heard of neurasthenia, there’s a good reason: the term is no longer used. In 1869 neurasthenia became a trendy diagnosis to describe a set of symptoms that included depression, muscle pain, fatigue, headache, irritability, the inability to concentrate, anxiety, dizziness, and fainting. It was first thought that the condition only struck people of a higher socioeconomic status and intellectuals, because they had more sensitive nervous systems and were exposed to the mental demands of modern industrialization. However, over time people of lower social status were also commonly diagnosed with neurasthenia. “Rest cures,” which were popular for anorexia and hysteria, were also given to people with this diagnosis. Literary figure Virginia Woolf was prescribed such a rest cure, which could last up to 8 weeks. During this time the patient was cut off from family and friends, spending most of the day in bed while being forced to endure a high-fat, milk-heavy diet. Patients were prohibited from doing any recreational activities and if needed, massage and electrotherapy could be used to keep muscles from deteriorating. It was thought that such a course of treatment would give the patient time away from the stresses of regular life. To me, this sounds like a nightmare which might only compound the symptoms of depression and anxiety. George S. Hughes, Virgie’s husband & senior by 11 years, was a tobacconist. This was an occupation held by many prominent members of Danville society at that time. He was also one of the founding members of the Danville Tobacco Association, a group that he would become President of years after his first wife’s death. Virgie and George had gotten married around 1880 and they lived with her parents, Jacob and Fanny Thomas, and several boarders at 339 Wilson Street. Virgie’s father was also a tobacconist as were the boarders. In the 1881 Danville City Directory both George and Jacob are listed at 858 Pine Street, so the family moved after the census. 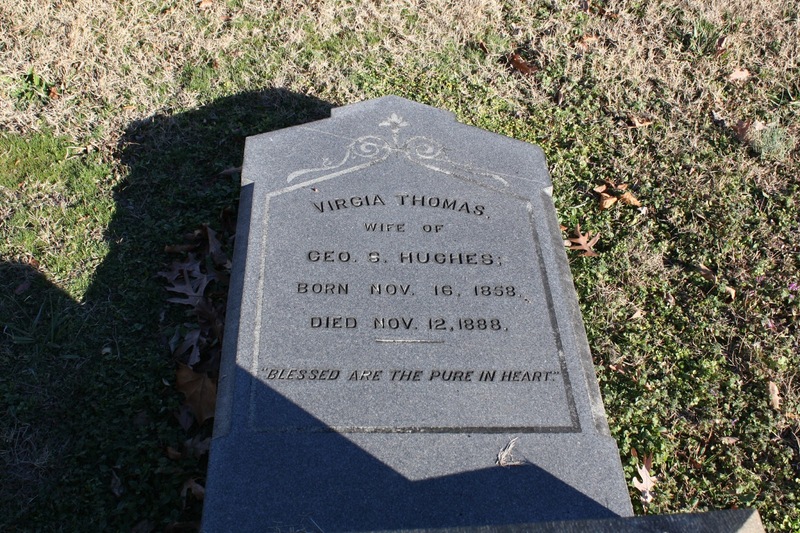 In 1885 Virgie gave birth to Thomas Hughes. If Virgie had another child or was pregnant at any other point in the marriage, I do not know. The couple’s second child, Virgia Thomas Hughes was born on March 4, 1888. (The name of the child might have somehow caused confused with Virgie’s tombstone later on.) Also in 1888 (October 20), Thomas died of a bronchial infection caused by diphtheria. In a few weeks Virgie was also dead, just before her 30th birthday. I wonder if Virgie’s “nervous condition” was related to postpartum depression and if the presence of diphtheria in the household played a role in her death. One 1920 newspaper article states that neurasthenia is not fatal and other information suggested that it was rarely, if ever, considered to be the primary cause of death. Again another facinating post. Having suffered myself from postnatal and even prenatal depression, I for one am glad we live in a time when it is more widely recognised. Really an interesting post! I have read about the history of mental illness and women — and I agree that the “rest cure” sounds like a kind of mental torture. If you weren't mad when you were given the “cure,” you might well be after going through a period of it. What a shame that this woman went through this.